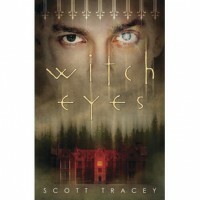 Review: Braden has Witch Eyes-he is able to see all the magic, feelings, and generally everything in the world. After hearing Uncle John talk about Belle Dam, he is drawn there, to find out about the family he's not known. There, he finds two feuding families, the Lansings and the Thorpes, who both want him.I've heard lots about this, and I probably got a bit hyped up over it. I like LGBT fantasy because then, sexuality isn't the focus of the story. There's some references to homophobia, but Braden and Trey are both comfortable with being gay, so there's more focus on the story.It's a very Romeo and Juliet-y set up, with two young people from separate sides falling in love (though happily without the same ending). The romance is quite rushed, and I didn't understand the conenction between Trey and Braden. Braden should go for someone else.The characters on their own, are good. Braden is on the very long list of characters who really needs hugs. Trey, he is very moodswingy. And quite annoying at times. Jade and Riley are really cool. Lucien, you can tell he's hiding something and it comes to a good end. Catherine and Jason, I'd like to get to know a bit more. I didn't understand Gregory.Plotwise, it was a bit too jumpy for me to get into it. Lots of things happen, but they don't seem to connect. It's also quite open ended, finishing off the bit with Lucien but leaving a lot of questions unanswered, and a lot of areas with more to explore.The magic. The idea of the eyes is really cool, and quite original. This leads to some beautiful passages where we get the description of what Braden sees without his eyes being shielded. There's a lot of rich history and mystery in Belle Dam, to do with Grace, and her legacy.Aside from the whole Romeo Juliet family feud fall in love thing, it's definitely original.Overall: Strength 3 tea to a book that I was expecting more for, but I enjoyed what I could get out of it. I'll read the sequel.